HOW IT LOOKS The new range features a “montage-like design” with a combination inspiring, shapes and colours. 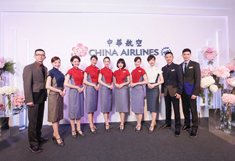 Chang is more known for costume design for movies, but for China Airlines his collection ranges from the standard stewardess uniform influenced by the 1950s-style cheongsam, to the more conventional but stylish suits for males. HOW IT LOOKS Kokosalaki has gone for “functional, elegant with a hint of Grecian classicism” while retaining Aegean’s blue, red and grey corporate colours. Stewardesses have striped scarves designed to complement the dark blue dress. Suits for the male crew are dark blue, but with a more classic cut. DESIGNER Developed in-house through a collaborative effort by Mango employees. HOW IT LOOKS South African low-cost airline Mango’s uniform now boasts a sleek and professional look with retro elements. Clean, tailored lines with softer hues are woven into the look. The flight deck moves away from a pure orange shirt to traditional white with orange trim and, in line with that retro feel, leather aviator jackets. HOW IT LOOKS Vietnam Airlines stewardesses are known for their iconic red ao dai (traditional Vietnamese dresses), which were introduced back in 1998. The new look carries on the tradition but features a distinct colour change to suit the interior décor of flag carrier’s new A350 and B787-9 aircraft. 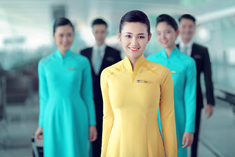 Attendants serving business class will sport a yellow ao dai, while their colleagues in economy will wear a blue one. HOW IT LOOKS More than 75 per cent of the Spanish carrier’s cabin staff contributed suggestions for the new design. Changes include grey scarves and neckties for pursers, while more junior cabin attendants wear yellow. Gloves are now worn as all in-flight services are performed and male attendants have chevrons on their sleeves. Female crew members have a choice of one-piece dresses, blouses with skirts or trousers. To top it off, the overcoats have also been redesigned.